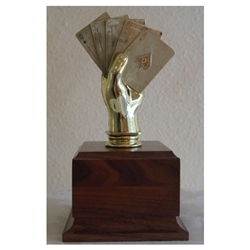 Poker Hand Trophy. Total height measures 10.25"
Poker hand of 10-J-Q-K-A comes mounted on a cherry finished wood base. We add a gold name plate to the front of the base with your free personalization. This item can be used as a winner or perpetual trophy by ordering additional name plates (item #NP100) that we can attach on the sides.